If you were injured in an automobile accident in Charlotte, we can help you get the medical attention you deserve, regardless of whether you are covered by health insurance. If you are covered by a health insurance policy, they will pay medical bills incurred as the result of an automobile accident. We will still seek to recover the amount of your bills, plus pain and suffering, from the insurance company for the car that caused the wreck, but your health insurance will be primary. Some health insurance policies will have a right to get paid back (subrogation) if a third party (the at fault driver) is responsible. At the end of your case, we can negotiate with them to pay back a lower amount than they paid your providers. If you are not covered by health insurance, we can make arrangements for you to obtain medical treatment on a “lien” basis. This means that the medical provider will agree to treat you without paying up front, but you must sign a document stating that when the case settles, they will get paid before you do. Most often, the medical provider will only agree to this if you are represented by an attorney. 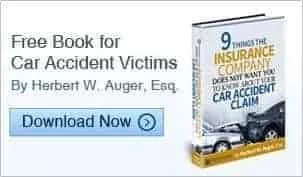 Auger & Auger has been handling car wrecks in Charlotte, North Carolina since 1995. We have maintained professional relationships with many medical providers in this area and can help you get the treatment you need.